Finger plates or push plates from The Door Knocker Company are mostly cast in the UK using traditional methods and authentic period patterns. The brass finger plates are polished and left unlacquered, just as they would have been when they were first made. Finger plates were primarily used, in the Victorian era, to keep the paint-work clean where the door is most often pushed open or closed. Now, finger plates are a great way to decorate the door and re-create the look of a by-gone era. Our finger plates are all made from brass and most of them are cast, though three designs are made from pressed brass, another traditional method of making fingerplates. A beautiful solid brass finger plate in the Art Nouveau style, depicting a classical decorative design. Hand polished and unlacquered. Made in the UK. A traditional decorative cast brass finger plate with mythical design. A solid brass slim finger plate with subtle decoration, ideal for doors with slim panels. Sizes: 245mm (9.6") high x 45mm (1 3/4") high. A highly decorative Victorian fingerplate or push plate traditionally cast and hand polished. Unlacquered. Sizes: 260mm (10.2") high x 75mm (3") wide. An open trellis work fingerplate or push plate as seen on BBC's Dickensian. Sizes: 305mm (12") high x 70mm (2 3/4")wide. The large closed trellis finger plate or door plate was used extensively in the BBC's Dickensian. Traditionally made in the UK. Sizes: 285mm (11.2") high x 75mm (3") wide. The small cast brass closed trellis finger plate or door plate is traditionally made in the UK and hand polished. Sizes: 195mm (7.7") high x 75mm (3") wide. This solid brass fingerplate or door plate is of a typical Regency design. The simple lines lend themselves to all the beehive designs in our range. Sizes: 273mm (10 3/4")high x 67mm (2.6") wide. 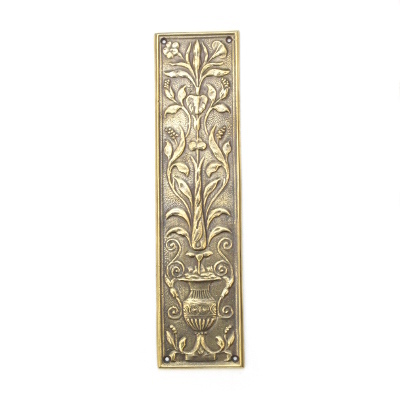 A beautiful solid brass finger plate in the Art Nouveau style, depicting a classical decorative design. Hand polished and unlacquered. Made in the UK. Sizes 270mm (10 5/8") high x 75mm (3") wide. These finger plates or push plates are tradtionally made from pressed brass. These plain fingerplates or door plates are tradtionally made from pressed brass. This plain Victorian design has an aged brass finish. 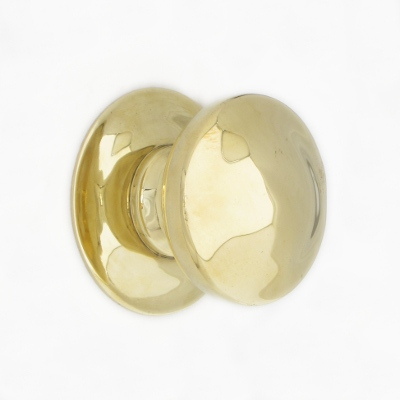 These reeded fingerplates or door plates are tradtionally made from pressed brass. This reeded design has been copied from an original Victorian finger plate and has an aged brass finish.